The primary matchup that everyone else has been talking about is that between the Jets corners vs the Colts WRs. It is expected that the Jets Darrelle Revis will again match up against Reggie Wayne and that Antonio Cromartie is going up against Garcon. I think that the Colts outside WRs will be mostly taken out of the game. This is based on recent games the Colts have played against strong man to man teams. I expect that we will see Wayne catch a couple of the ten yard hitches that he is famous for and that they will hit Garcon on a few short slant routes, but I don't see the Colts getting any downfield passes to Wayne or Garcon since they are being defended by patently superior athletes. Where the Colts will make their passing yards will be in man to man matchups against the Jet linebackers and safeties. The Jets know that this is their weakness, so they will probably have to do some tricky things to keep from getting taken apart. What we will see is a tough (but not bump and run) man to man on the outside and on the slot and running backs. Where the tricky part is that the Jets will have a linebacker or lineman in a short zone defense about 5 yards behind the line of scrimmage who will be keying on Peyton Manning's eyes. This will be primarily to protect against quick crossing routes by Jacob Tamme. 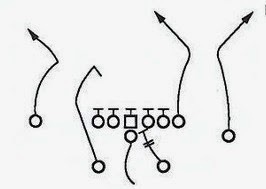 This also helps the Jets control the Colts draw play as they will have someone with eyes in the backfield at all times. Will the Colts be able to defeat this scheme? Yes, but it will hinge on the time that Manning has to throw the ball. You will still be able to have success throwing over the middle against this defense, but it will take time for Tamme to clear the middle and get away from the zone defender. 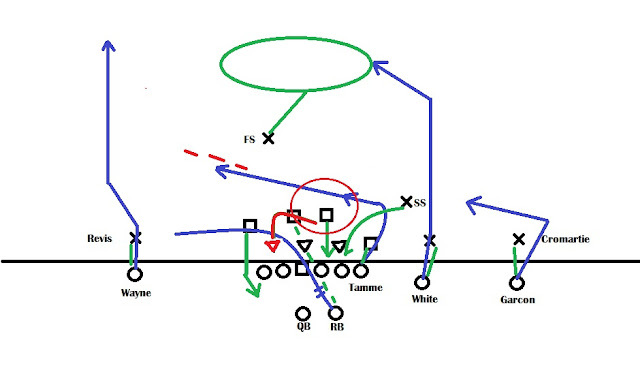 In this example the Colts are running a crossing pattern with Jacob Tamme at TE. The Jets are shown here in one of their typical blitzes. The SS, LILB, and the ROLB are all blitzing. The LOLB is covering Tamme and the RILB is covering the running back. The FS is in a zone defense covering the deep middle of the field. The cornerbacks are all matched up on a single receiver in man. The important player to look at is the Right Defensive End (RDE) for the Jets (in red). Instead of rushing the passer as usual, he spins around and takes a position in the short middle of the field - covering that area in a zone defense. As a large lineman, he does not have much range. The hope is that Manning will not see him and throw a ball right to him, or that at least Manning will have to delay his throw to Tamme until he clears this area. This also has the effect of delaying Manning's switching to his secondary receiver (which in this case would be Garcon). This can throw the timing of the whole play off. By the time Tamme clears the zone area, if he is not open it will probably be too late to hit Garcon on the short In Route he is running. The Jets would hope that the rush will have gotten to Manning before he can hit the check down receiver (the RB). This is just one example of how this works - just a small part of the chess match between Manning and Rex Ryan. Nice write-up Scott. Makes me nervous. I think the Colts will win this one, but only because the Jets have not rushed the passer well this year. Not having Collie or Clark is killing us. Why has the Colts Running Game Improved?